Remarkable surgical procedures have been developed to rejuvenate the appearance of your eyes and face by correcting sagging eyelids, eliminating pouches and bags, removing excess skin folds, and smoothing out frown lines in tissue. 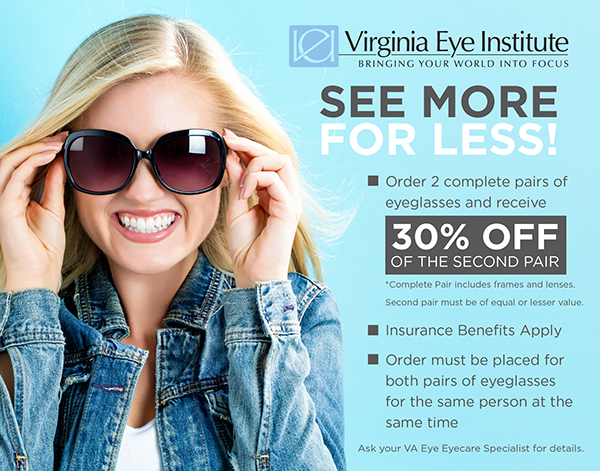 When performed by Virginia Eye Institute’s experienced Ophthalmic Plastic Surgeons, successful cosmetic eye surgery gives a natural-appearing result. Your friends will notice a refreshed, more youthful and rested appearance – as will you. Eyelid surgery to rejuvenate the appearance of your upper or lower eyelids is called blepharoplasty. This affordable procedure removes the excess fatty tissue around your eyes that causes an aged, tired appearance. Leaving no obvious scars, the tiny incisions are hidden in the natural folds of your eyelids. In some cases, the surgery can be performed without a skin incision. Sagging or furrowed eyebrows and cheeks may also contribute to a tired appearance and can be repaired in conjunction with blepharoplasty. Other procedures such as tissue fillers and Botox require even less downtime and can be performed in our offices. Juvederm and Restylane are excellent for filling age lines around the mouth and eyes. Botox helps to flatten wrinkles around the eyes or forehead caused by grinning or frowning. Reconstructive procedures for age-related changes and drooping eyelids are also offered at VEI. Additionally, we can provide repair of skin cancers, tearing problems, and traumatic injuries around the eyes. Most of our procedures are outpatient and are performed under local anesthesia with sedation by the highly trained and experience doctors at VEI. With careful post-surgical care, recovery from cosmetic eye surgery is surprisingly brief – with most patients resuming their normal schedule just one week after surgery. William H. Bearden III, M.D., F.A.C.S. Nicole A. Langelier, M.D., M.B.E.